ifically known as Syncerus Caffer, the African Buffalo is a large bovine in Africa and not keenly related to a bit larger and Wild Asian Water Buffalo. Though its ancestry is still unclear, the Cape Buffalo also referred to as the Syncerus caffer caffer is the largest subspecies of African Buffalo and is widely spread to the parts south and Eastern Africa including Uganda. The Forest Buffalo scientifically referred to as Syncerus caffer nanus is the smallest of the Subspecies spread in the West and Central Africa. The Syncerus caffer brachyceros is spread in the West of Africa while the Syncerus caffer aequinoctialis is spread in the Central African savannahs. The horns of a mature buffalo form its differentiating feature and have got fused bases that form a continuous bone shield regarded as the boss. The Buffaloes are generally regarded as a dangerous animal and it puts down over 200 people per year. The African Buffalo is not in any way related to the domestic cattle but is loosely connected to other larger bovines. Considering its dangerous nature which is unpredictable, the African buffalo has presented a challenge to any domestication move compared to the Asian Water Buffalo. It can be noted that apart from the human beings, the Cape Buffaloes have got few predators and besides lions, the Cape Buffaloes can defend themselves. Considered as part of the Big five animals, the Cape Buffalo presents a hunting trophy. The African Buffalo is a strong animal Species that can reach a shoulder height of 1 to 1.7 m with a body length of 1.7 to 3.4 m. If matched with other large bovines, the African Buffalo possess a long and stocky body with a body length that exceeds that of the water buffalo which is considered to be taller and heavier. The African Buffalo has thick legs leading to short standing height. Its tail ranges from 70 to 110 cm in length. The Savannah dwelling Buffaloes weigh up in between 500 to 900 kg with the male Buffaloes always larger in size than the female counterparts extending to the extreme weight limit. The smaller forest Buffaloes range between 250 to 450 kg. The head of the Buffalo is normally carried low and its top is positioned below the back-line. The Buffalo’s front hooves are noted to be wider than the rear which is required to support the heavier weight that is in front of the body compared to the back. More about the Sub species, the largest one is the Cape Buffalo also known as Syncerus caffer caffer is the darkest almost with black color. The forest Buffalo also referred to as S. c. nanus is the smallest and is reddish with darker patches on their heads and shoulders in the ears to form a brush. The Sudanese Buffalo also known as S. c. brachyceros is in between the above mentioned in terms of morphology. The Nile Buffalo also known as S. c. aequinoctialis is restricted to Central African areas with light color and smaller body. The Mountain Buffalo also known as S. c. mathewsi thrives in mountainous areas. Regarding the Ecology, the African Buffaloes have distinguished themselves as the most effective grazers on the continent of Africa along with the grasslands and the major African mountains. The African Buffalo prefers to dwell the habitat with dense forest cover including thickets and reeds but would also thrive in the open woodland. Though they do not require a specific habitat, they require having daily consumption of water. The Buffaloes like plains Zebra can still survive on tall and coarse grasses. The Buffalo herds can mow down the grasses and the selective grazers can benefit. The Cape buffalo makes use of its wide incisor row and tongue to consume grass quicker than most of other herbivores in Africa. The Buffaloes are noted not to stay on depleted or trampled areas for long. Regarding the predators, the buffaloes are prone to human poaching and apart from the humans, the lions are their hunters. However, the lions do not prey on them always and it normally takes a count of lions to bring down a mature Buffalo though there are some instances where the adult male lion have been noted to bring down adult animals. The Nile crocodiles tend to attack solitary adult Buffaloes and young calves. However, they can still kill a healthy adult Buffalo. The leopard, cheetah and Hyena are threats to the newly born calves though spotted hyenas have been noted killing adult Buffalo bulls but on very rare occasions. Regarding Disease, Cape Buffaloes are prone to a range of diseases among which include the bovine tuberculosis, foot and mouth disease and corridor disease. However, it can be noted that Buffaloes can remain with these diseases in dormant nature so long as the health of the animal is good. These diseases however limit the movement of these animals and at time fencing the infected areas from the uninfected areas can be done. In some parks, the wardens and rangers have opted to protect and breed herds that are disease free and these later become valuable when they are transported. Regarding the Social behavior, the Buffaloes are variable in size and the herd’s core is usually comprised of related animals and their offsprings with hierarchy featuring linear dominance. The basic herds are surrounded by high ranking females and males, the subordinate males and old animals. The young males observe a considerable distance from the dominant bull that is recognizable by his horn’s thickness. In the dry season, the male Buffaloes split from the herd to form the bachelor groups and these are usually in two types. The one group that comprises of 4 – 7 years and the second one comprises of males 12 years and above. In the wet season the herd re-units again to do the mating. Some of the older bulls resolve not to rejoin the group again since they can no longer compete with the young ones and the more aggressive youthful bulls to mate. The males feature a hierarchy of linear dominance which is based on size and age and since a buffalo is safer for its life when thriving in a large herd, the dominant bulls at times tolerate the copulation of subordinate bulls to rely on them. Regarding sparring, the adult bulls can spar in play, actual fights or dominance interactions. The bull would definitely approach the other lowing holding his horns down in anticipation that the other will follow suit. The bulls twist their horns from side to side and if the sparring is denoted for play, the bull might rub the face of the opponent and the body during the session of sparring. The actual bull fighting is very violent though it lasts for a short time and rare to encounter while the females do the sparring at all. The high degree of altruism is noted in the African buffaloes. The females tend to demonstrate a form of voting behavior where by during the resting time they would stand up, shuffle around and the lay down again. While lying down again, they face the direction that they think that they should take and following a period of shuffling around about 1 hour, the females travel in the direction they resolve to take. This resolution is communal and is not influenced in anyway by dominance or hierarchy. When they are attacked by the predator, they keep together making it hard for the predator to pick any and the young ones are gather in the middle. The Buffalo herd would respond to the distress call made by the captured Buffalo and would try to rescue. The calf distress call would attract much attention from the entire herd other than the mother alone. The Buffalo herd undertakes a mobbing behavior during the predator fighting. Regarding Vocalizations, the African Buffaloes are noted to be making a range of vocals. The counts of calls are lower pitched forms of those made by domestic cattle. The Buffaloes make 2 – 4 second calls sporadically 3 – 6 second intervals signaling the herd to embark on the move. While signaling direction change, the leaders release creaking gate sounds. Some Buffaloes make long maaa calls for close to 20 times a minute while heading to drinking water. They make explosive grunts in case of an attack and these calls might last long. The cows produce croaking calls while searching for their calves. Higher call of distress would be made by a calf while being attacked. The dominant also tend to make calls to denote their location and presence or a similar version of the call but a bit intense might be made as a warning of an encroaching inferior. 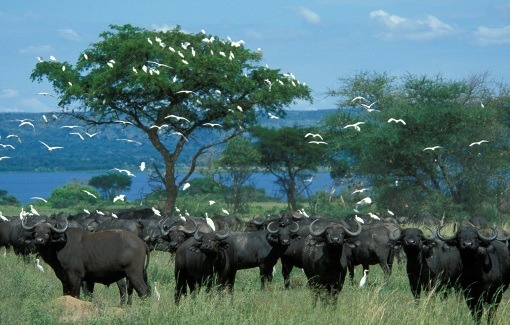 The African Buffaloes would make a range of sounds including bellowing, grunting, croaking and honking while grazing. Regarding Reproduction, it should be noted that African Buffaloes mate and produce in the rainy seasons only and the birth peak tend to take place at the start of the season while mating comes later. The bulls guard the cow during mating keeping other bulls at bay. However, this tends to be hard as the cows tend to be evasive and this pulls many males to the event. At the time when the cow is in full estrus, the dominant bull is only in control. The Cows produce at the age of five following a gestation of 11.5 months. The newly born calves hide in the vegetation for the count of the first weeks under the care of the mother until is good enough to join the herd. The older caves are places at the center of the herd for safety. The parental touch between the mother and the calf tend to extend longer than in other bovines but when the mother produces a new calf, the bond with the old one ends an keeps her at bay using horn jabs. The males tend to leave their mothers at the age of 2 years and would then join a bachelor group. The young calves unlike for other bovines suckle form behind pushing the head in between their mother’s legs. Regarding their relaxation ship with humans, the apparent status of the African Cape Buffalo depends on its value for both tourists including those that undertake safaris in Uganda and trophy hunters creating the need to conserve and enforce anti-poaching measures. The Cape Buffalo populations stand at 900,000 and the Buffalo is noted as least concerned by the International Union for the Conservation of Nature. The recent buffalo census featuring all Sub Species of African Buffalo put the figure at 513,000 members. The African Buffaloes faced heavy losses during 1980s succumbing to Rinderpest coupled with pleuro-pneumonia extended severe loss of about 95% of the wild ungulates and livestock.